Online registration is now closed. You can still attend Executive Council Winter Session by registering onsite. Please fill out and bring the Onsite Registration Form with you to the registration desk located outside of the National Ballroom. Click here to download the Youth Commission Agenda! Needing to hold a side meeting? 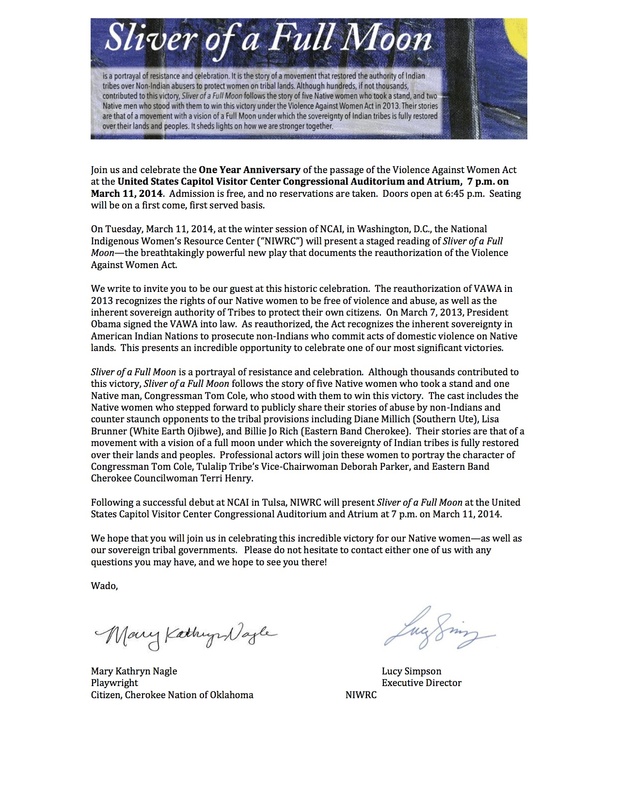 Please fill out the Side Meeting Request Form and return to Kellcee Baker at kbaker@ncai.org. Interested in being an NCAI Sponsor? Please fill out our Sponsorship Form. For information regarding Sponsorship please contact Bernida Humetewa at bhumetewa@ncai.org. To book your room please click here or call the hotel and ask for the NCAI 2014 Executive Council Winter Session room block . The rooming block is now closed. If you need assistance making alternative accommodations, feel free to contact Marilyn Matthews at 202.289.2220 ext 101 or mmatthews@formeetingsolutions.com. For more information contact Brett Shelton at 605-381-6771 or Shelton@narf.org. Sliver of a Full Moon will be staged at the United States Capitol, Visitor Center Congressional Auditorium and Atrium, 7 p.m. on March 11, 2014. Admission is free and the event is open to the public. Seating is on a first come basis, with doors opening at 6:45 p.m.
For more information contact Julie Johnson at 360-640-0222 or juliejj2012@gmail.com. For more information contact Josie Raphaelito at 202-736-2905 or josie.raphaelito@aspeninstitute.org. Senate Committee on Indian Affairs: Oversight Hearing on "Tribal Transportation: Pathways to Infrastructure and Economic Development in Indian Country." The Mandan, Hidatasa, Arikara Nation proudly presents Tribal Leaders & Congressional Members Capitol Hill Reception, Thursday, March 13, 2014 at 12:00 PM in the Senate Russell Room 188. For more information contact Dennis Worden, NACA Legislative Director at 202-758-2676 or dennis@nativecontractors.org.